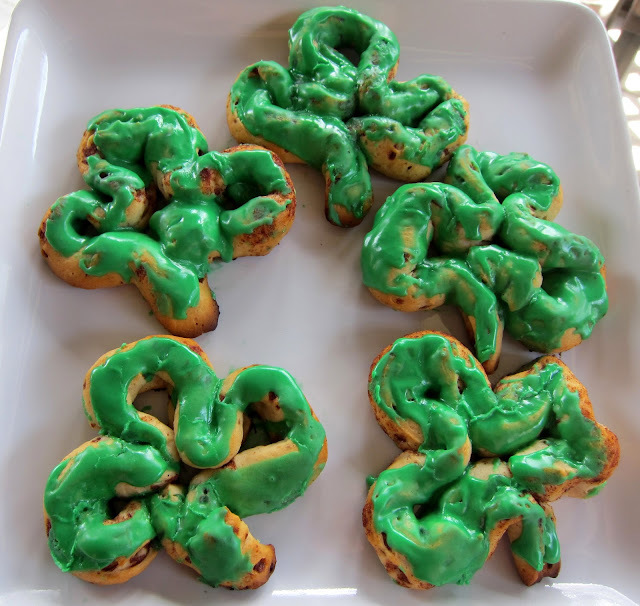 We are continuing the green theme this week with these cute shamrock cinnamon rolls. This only requires one ingredient - a can of refrigerated cinnamon rolls. 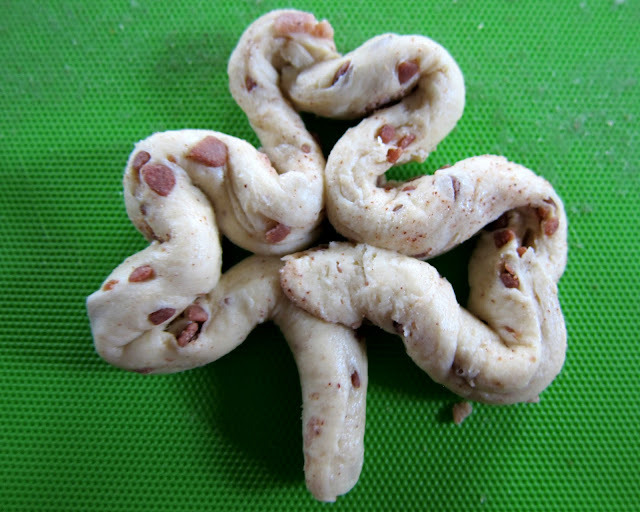 I unrolled the cinnamon rolls and quickly shaped them into these darling shamrocks. These were so easy and so much fun to eat! 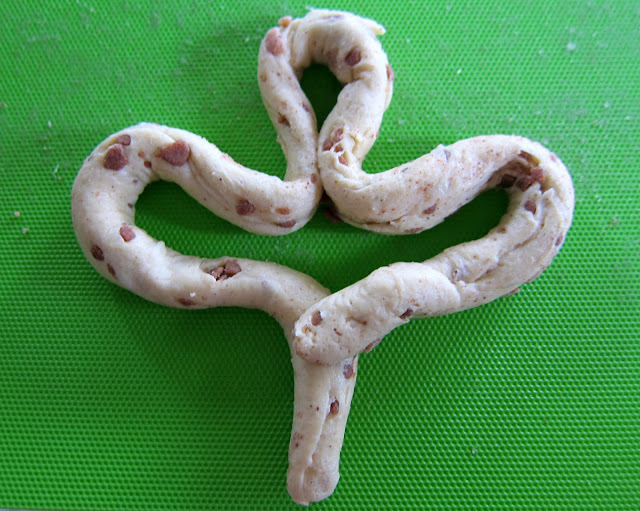 I took some play-by-play photos to help illustrate how I made the shamrock shapes - scroll down for more. 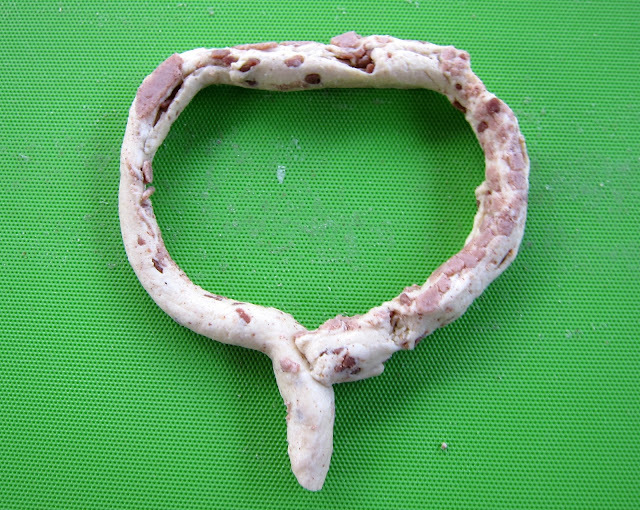 Unroll the cinnamon rolls and roll dough into a long rope - about 12-15-inches long. Form rope into a conversation bubble shape. Make three bumps in the conversation bubble. Pinch middle of each bump to make little hearts for the shamrock leaves. Fluffy gives these two paws up! Unroll the cinnamon rolls and roll dough into a long rope - about 12-15-inches long. Form rope into a conversation bubble shape. Make three bumps in the conversation bubble. Pinch middle of each bump to make little hearts for the shamrock leafs. Bake for 10-12 minutes, or until golden brown. Mix green food coloring into icing that is included with the cinnamon rolls. 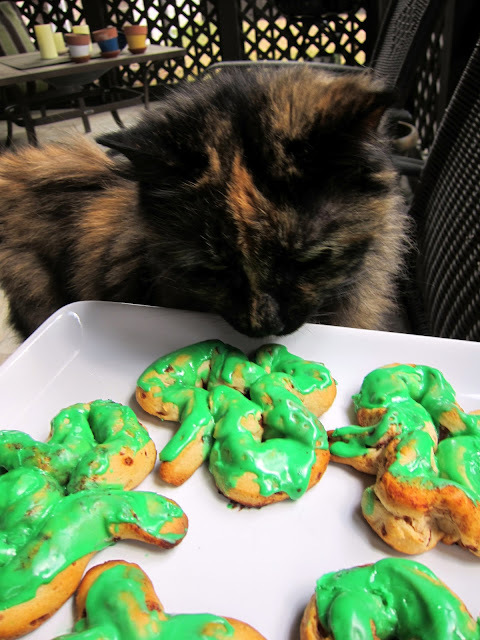 Frost warm shamrocks and enjoy. Love this idea, but then I love most of your ideas! I can not wait to try this recipe with the kids. When I do would mind if I blog it and link ur website on my blog?? Elizabeth - that is fine. Hope they are a hit! This is so awesome...and I'm gonna make them. I always post about what I cook from your recipes but I always link back to you. bj - ALWAYS take the credit. It will be our little secret! So glad you are enjoying the recipes! Just popping in after I saw a picture of your cinnamon rolls on Pinterest. What a CUTE idea! I've repinned (and plan to make these on Saturday) and made sure I linked to your website. Thanks for the cute idea! Happy St. Patrick's Day!